For the third installment of The Battle of The Downtown Memphis "Sliders" (which I never thought would happen), I decided to stick with a theme similar to Part 2 of the series. In the last "battle," I went with contrasting styles in comparing an upscale restaurant to a lounge bar. With the establishments appealing to different demographics, I was curious how the sliders would be prepared. This time around, I've repeated the process, although that wasn't my intention. In choosing Mollie Fontaine Lounge as one of the "combatants," it was inspired by coincidence. During last month's 2012 Beale Street Wine Race, I ran into a bartender that I've known for a long time. The bartender, Bjarni, has worked at several places that I like. Those places include Automatic Slim's and the Beauty Shop, owned by the same people who own Mollie Fontaine. While he still works at the Beauty Shop during the week (and at Max's Sports Bar), his weekends are spent bartending at Mollie Fontaine (or as I like to call it, "Mollie's"). With me not having seen him in a while (although we interact on Facebook), I decided to pay him a visit. In getting there, I took the Madison Ave. trolley to a stop near the aptly named Trolley Stop Market. After walking a few blocks down Orleans St. to Adams Ave., I turned left and proceeded to Mollie Fontaine. The reason for mentioning this is because of the lounge's "off the beaten path" location, I felt it was important to point out its accessibility. For my Downtown friends who like to trek to Memphis' South Main District, the travel to Mollie's is about the same. Therefore, I don't see any reason not to visit the lounge occasionally if for no other reason than to support Bjarni and the rest of the fine staff at Mollie Fontaine. Once I got to the lounge at about 7 PM, I noticed that there weren't any patrons there besides me. With me literally having the place to myself, I got a chance to get reacquainted with Bjarni. While I was rapping with him, I asked about the Macaroni & Cheese that was featured in the blog I Love Memphis' "100 Things to Eat in Memphis" list. He assured me that the Mac n' Cheese was as good as the hype. I had to be convinced, because I've been letdown in the past by similar promises. Fortunately, Mollie's delivered, for the small bowl of Mac n' Cheese was the best that I've tasted in a long time. 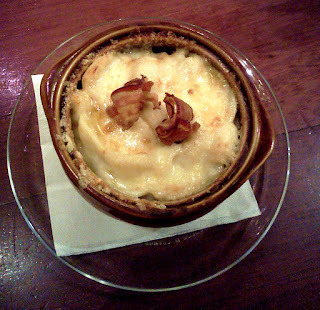 It consists of Fortina and Gruyére cheeses and topped with pieces of bacon. The cheese mixture yielded a creamy taste that was very appealing to me, with the bacon adding a crunchy dimension to it. I also liked the thick texture, which took away my worries about making a mess. Overall, it's a great dish that's worthy of inclusion in the I Love Memphis list. 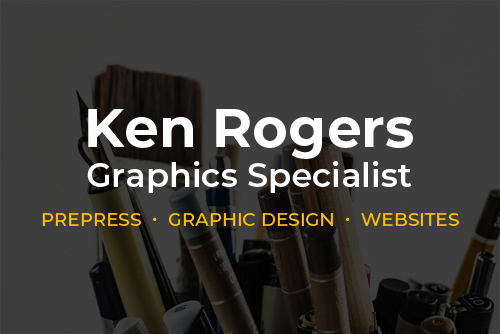 At this point, you may be asking yourself "damn, when will Ken talk about the sliders?" Well, after I had the Macaroni & Cheese, I checked Mollie's menu to see what else was on it. Lo and behold, sliders were listed. When I saw this, I knew that a "battle" was on. Mollie Fontaine's version of the slider consists of a small patty of smoked ground beef with several toppings. The toppings include arugula, onions, bacon, Gruyére cheese, pickles, mustard and "Mollie Sauce" (whatever that is). Even with numerous toppings, the ones that stood out the strongest were the raw onions and arugula. Those toppings, along with the others, made the sliders bitter in a way that didn't suit my palette. The beef was average in terms of taste (despite the meat being "smoked") and was overwhelmed by the toppings. On a scale of five, I would give the sliders a three. The sliders were decent, but far from the best. At the time I placed my order, I was drinking a Stella Artois, one my favorite beers. While it goes well with certain foods, I don't believe it is a good match with Mollie Fontaine's sliders. In my opinion, the spicy sliders didn't mesh well with the malty flavor (with a hint of hops) of the Belgian lager. If I order them again, I'll likely choose the Jamaican lager Red Stripe or a Mexican-style lager that is less malty and bitter. Also, given that Mollie Fontaine is more of a lounge than a restaurant, you might be more comfortable with a red wine such as a Pinot Grigio. It's a good alternative because it not only complements the sliders, you will look good drinking it. Of course, this is my opinion (partly based on an outing to the recently closed Thyme Bistro where the wine made a huge difference in my meal). Your take on this could vastly differ. Overall, my experience at Mollie Fontaine was great. I enjoyed the company that Bjarni provided and the atmosphere was breathtaking. With regards to the food, I liked what I had but it wouldn't be my first choice for dinner if I was really hungry. Both of the dishes that I had costs $9 each, which is a little beyond my budget (although I got a dollar off of both because it was "Happy Hour" when I ordered). Of course, as a guy who doesn't make much, I'm looking at this from a different perspective than those that the lounge is trying to attract. With regards to the sliders, I would rather get three sliders with fries from Bardog Tavern that cost $8 that are slightly beefier and better tasting than Mollie's two sliders, sans fries. However, even though Bardog offers the better value, it doesn't provide the relaxed late night atmosphere that Mollie Fontaine does. The lounge is in a Victorian-style house that is elegant in design. The interior is adorned with art, antique lighting, classic couches and chairs and other items consistent with a mansion. One could easily immerse himself/herself in relaxation while chomping down on comfort food. With the right wine, I could easily see myself chilling out with a slider on a late Friday night, which is what Mollie Fontaine Lounge is all about. For Mollie Fontaine's "opponent," I chose a restaurant that a friend cited as an example for why I shouldn't write a food blog. When I started this blog nearly two years ago, my friend Clay (the same guy mentioned in my response to "Air Traffic Mike") tried to persuade me to not start a food blog. He thought that a guy collecting unemployment checks shouldn't be blogging about restaurants. Clay believed it would make me look like a lazy government-mooching douchebag (my words, not Clay's) who was more concerned about getting his grub on than finding a job. I took his advice to heart and held off blogging for a while. Fortunately, a month later I was hired by the Memphis Grizzlies as a part-time ticket seller at the FedExForum. Once I got the job (which is seasonal), I went back to blogging. As homage (or more of a goof) to Clay, I chose Felicia Suzanne's, the forbidden restaurant. As I was writing this review, I noticed some interesting similarities between Mollie Fontaine Lounge and Felicia Suzanne's. Both places are named after women and are in Downtown Memphis on streets named after early American presidents. However, even though it's listed on Monroe Ave., Felicia Suzanne's is only accessible from Main St.
Felicia Suzanne's sliders, consisting of Black Angus beef cooked "well done," tasted great. The seasoned beef, cheddar, aioli and caramelized onions provided a spicy and slightly sweet flavor that overwhelmed my taste buds. 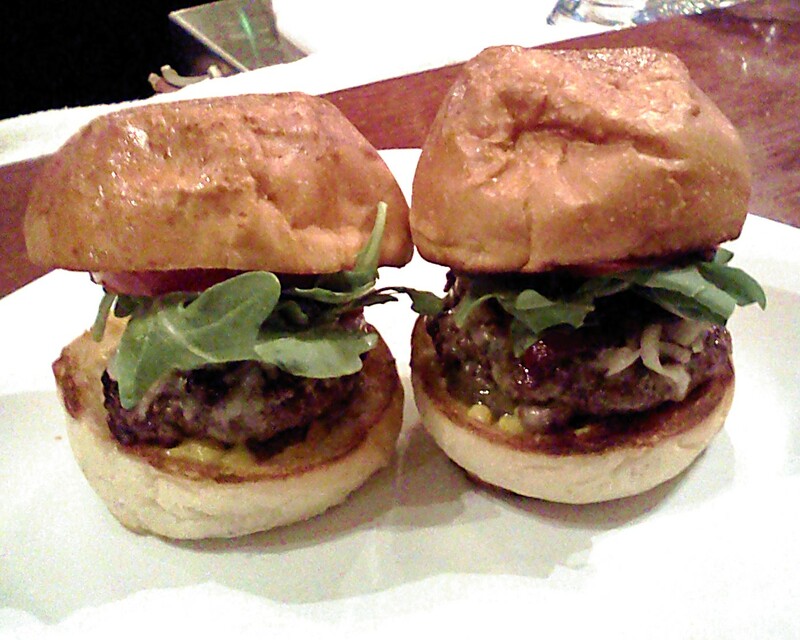 Compared with what I had at Felicia's nearby competitor Flight, Felicia's sliders are clearly better. Unlike Flight, Felicia Suzanne's put a lot of effort in developing its slider, to the point that it rivals another nearby competitor Bardog Tavern. The sliders come with fries, sweet dill pickles and homemade ketchup. When I first saw the ketchup, I thought it was salsa. After I tasted it, I knew it was something else. The vinegar, parsley and other ingredients gave the ketchup a unique texture and flavor. In terms of texture, the ketchup isn't as thick as most people are accustomed to, but rather watery like a salad dressing. Speaking of salads, the ketchup could be applied to salads, tacos or anything else that has fresh, uncooked vegetables. Whenever I visit Felicia Suzanne's again, I'm definitely getting a cup of ketchup regardless of what I order. Felicia Suzanne's fries were also great. Before I go on, I want to say that I normally don't have an opinion about fries unless they are either extremely terrible or really good. Felicia's fries fall in the latter category, for they are fried to a light golden brown while retaining a soft texture (although the outer edges of some of the fries were crispy). The fries are seasoned with specks of red pepper and herbs, which gives them a very nice flavor. I'm not sure that Felicia's fries were the best that I've ever had, but they're good enough to put on my short list of favorites. For something that started as a "goof" on what a friend said had turned out to be a wonderful experience. Felicia Suzanne's sliders are among the best I had in Memphis. In fact, the sliders are among the best burgers I've had in the past few years. While eating my sliders, a got a bottle of Abita Light. I didn't intend to get this, hoping for something cheaper like a Bud Light. However, I was very satisfied with my beer for two reasons. The first is the price, which at $3.50 (probably the "Happy Hour" price) is a bargain for a premium beer. The second reason is that it goes really well with the sliders. The smooth malty flavor of the Abita perfectly complements the seasoning of the sliders and fries. 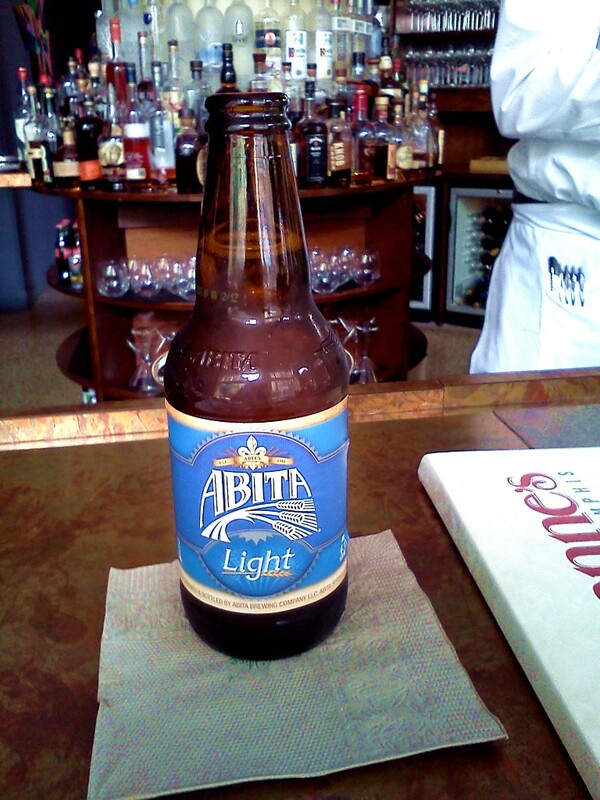 The Abita Light was an excellent choice for my lunch, which was one of the best that I had in a long time. It's unfortunate that the sliders are only served on Friday afternoons. Because Felicia Suzanne is an upscale restaurant and not a lounge, most patrons are looking for something more exquisite than sliders. If I was able to offer a piece of advice to Felicia, I would tell her to offer the sliders and some of her other lunch items exclusively at the bar. I believe that patrons who are "chillin'" at the bar after a long day at work might want to feast on a light snack while sipping cocktails. Something like a slider or a poor boy might be enough to satisfy the munchies. By the way, this isn't something that I came up with myself, but rather inspired by the "bar menu" offered by the Majestic Grille. I believe it has worked well for Majestic and could also be successful for Felicia Suzanne's. For those who dine at Felicia Suzanne's for dinner, I can't offer much advice because the restaurant is a little out of my budget. 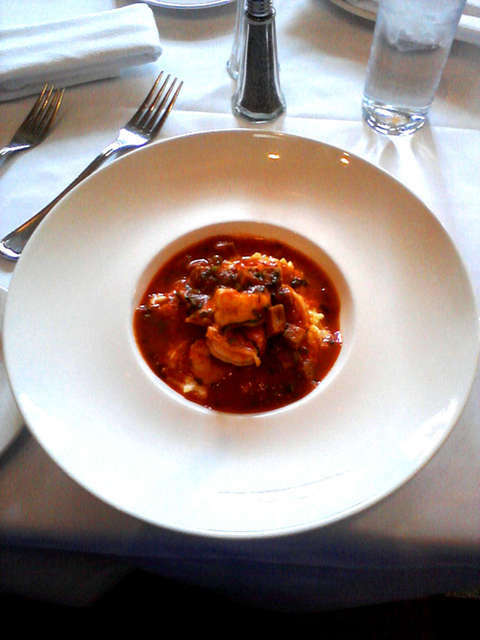 However, I had one dish that is offered on both the lunch and dinner menus, the Shrimp & Grits. As a "Low Country" South Carolina entrée, I'll admit that I'm not the most knowledgeable about it. However, I have had the dish at several places in Memphis, including Sweet Grass, whose Shrimp & Grits is listed among "100 Things to Eat in Memphis". By comparison, the Creole sauce in Felicia Suzanne's version really appealed to me. I can't go into detail since it’s been awhile since I had it. However trust me when I tell you that the Shrimp and Grits are really good. If I'm ever able to, I'm definitely ordering this again. The second reason that I like the sliders from Felicia Suzanne's over Mollie Fontaine Lounge was for its value. At $10 (not including tax) you can get three sliders and nicely seasoned fries from Felicia Suzanne's, as opposed to two sliders from Mollie Fontaine that cost $9. In terms of appetite satisfaction, it's clear that you'll get more "bang for your buck" from Felicia Suzanne than from the tapas menu of Mollie Fontaine. Maybe I should have asked Bjarni, but I didn't see anything on the menju (like a salad) under $5. For those on a budget, Mollie Fontaine Lounge might not be a good choice. Therefore, if you want to get your grub on without breaking the bank, I recommend Felicia Suzanne's. So for this battle of sliders, the clear winner is Felicia Suzanne's. Unfortunately, like Flight, Felicia's sliders are only offered on Friday afternoons while Mollie's isn't open for lunch. Because of this, the comparison might not fully benefit those who are deciding which restaurant to choose. In hindsight, I wish this "battle" and the one before it were more comparable in terms of matchups. However, even if I compared Flight to Felicia Suzanne's and the Silly Goose to Mollie Fontaine, the outcomes would have been the same in terms of winners. Between the two upscale restaurants, the differences are obvious. The Flight sliders' mediocrity doesn't come close to the ingredients and preparation that goes into a Felicia Suzanne slider. While Felicia's little burger could be perceived as a gourmet item, Flight's slider taste like something I can get anywhere. Maybe I'm wrong, but it seems that burgers aren't high on Flight's priorities. That said, the beef slider shouldn't be on the menu if the restaurant isn't fully committed to it. So in a head-to-head matchup, Felicia Suzanne's dominates. Unlike the choice between Flight and Felicia Suzanne's, picking between the two lounges wasn't as easy. In my opinion, choosing between them comes down to individual preferences. For those who like to think (and eat) outside the box, the combination of arugula and raw onions on Mollie Fontaine's slider is a good idea. Unfortunately, I wasn't with it, but I'm not saying it's a bad slider. I prefer burgers that are strong in pepper spices, something that Silly Goose's slider has an abundance of. The beef in the Goose slider is better seasoned and really stands out. Top it with slices of bell peppers and Pepper Jack cheese, and you have a really good burger. Of course, this is my opinion which may conflict with those who have milder palettes. So for me, The Silly Goose wins the lounge slider battle. From a social standpoint, Mollie Fontaine's interior design contributes to an atmosphere that feels very comfortable, making it my preference to hang out at. Therefore, I recommend going to Felicia Suzanne's on Friday's for lunch. 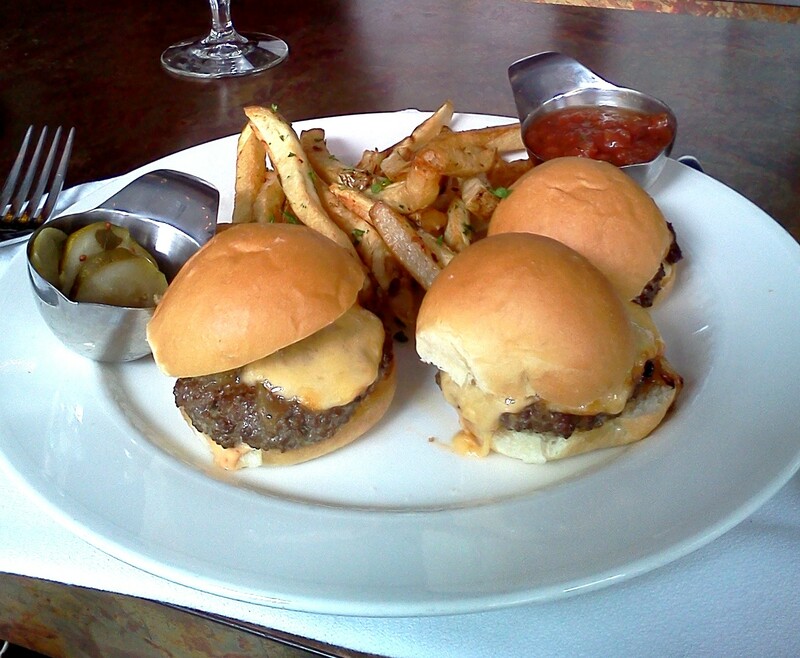 Then after work, chill out with a cocktail and a slider from Silly Goose before partying at Mollie Fontaine Lounge. It could make for a well-rounded fun day. "In getting there, I took the Madison Ave. trolley to a stop near the aptly named Trolley Stop Market. After walking a few blocks down Orleans St. to Adams Ave., I turned left and proceeded to Mollie Fontaine." You need to stop wasting your money on sliders. Invest in a grammar book. By the way, ask Clay to do his impersonation of you. It became a Sunday ritual at the Saucer.